Have you ever thought about emulating some classic sounds featured in the rock and roll hall of fame? Compression adds character and distinction to your sound while beautifully enhancing it. It will make you stand out amidst your band/group, and should you decide to get your hands on one of these babies, you might just realize it’s the missing piece you’ve been looking for. Where Do Compressors Fit Into An Average Signal Chain? Do You Really Need A Compressor Pedal? Top tier build quality and performance at a more than reasonable price. While it's not the most capable, this pedal is great budget solution. A pedal that is affordable but punches way above its weight class. Compressor designed in classic Wampler style with lots of controls and range. Boutique pedal that hits all the right buttons and delivers adequate performance. Simple solution that offers a surprising amount of versatility considering the price. Very transparent compressor pedal that gives you good range and tone control. A slightly unique compressor pedal that offers a different type of experience. Entry level compressor that brings a great performance, especially considering the price. Reliable Boss design that cuts no corners and delivers a balanced performance. Compressor pedals are all about versatility. After all, you are trying to mold the already dialed in tone into a very specific set of rules. TC Electronic understands this concept quite well. Their Hyper Gravity compressor pedal comes as one of the best and most flexible solutions both on the market, and in its respective price range. Enclosure it comes in is rock solid, there’s no doubt a bout that. This is a serious performance pedal, which means that needs to be able to take whatever abuse you area capable of dishing out. Controls come in form of the standard Level, Sustain, Attack and Blend. However, TC Electronic wouldn’t be the same if they didn’t add something extra. On top of the features we’ve mentioned, you also get a switch that allows you to choose between Spectra, TonePrint and Vintage modes. TonePrint is what gives you the ability to form your own compression curves using software, and upload them onto the pedal. Pretty impressive to say the least. Doing compression on a budget might seem like risky business, but there are pedals out there which allow you to exactly that. Joyo JF-10 is among the first which come to mind. 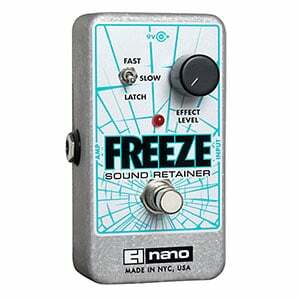 The pedal is simple, user friendly and capable of cutting out a wide range of frequencies. It just doesn’t feel like a cheap compressor at all. Aside from its rather formidable performance, you are looking at a quality built product here. The enclosure is sturdy enough for stage use of any kind, and you definitely don’t need to treat it like a prom queen. On a similar note, the knobs and the footswitch – two elements which are usually subpar on pedals in this price range – are pretty decent all things considered. While it probably isn’t the most capable compressor on the market, Joyo JF-10 Dynamic Compressor brings you the necessary performance to get that tone under control on a budget. That is something we can stand behind. The SP Compressor comes in a very compact and beautiful chassis with a miniature footprint, yet it offers more than what meets the eye. It is originally based on the Ross Compression, where many have failed, this little guy definitely succeeded. Down to the specifics, the control knobs on this pedal offer: Volume (up to 15 dB), Blend – ensuring flawlessly smooth transition in mixing with your original sound, and a three-way switch opting between: Low, Mid and High signal. This is not where it ends though, the pedal offers additional modification through its remarkable internal switches, you can check out the full review where we explain them in detail. This wonderful pedal evens out your tones with immaculate precision, a dynamic range of tone selection adding unique character to your original sound – from transparent to hard and snappy. Definitely one of the most versatile compressors out there, available at an affordable price overshadowed by its overwhelming magnitude of tweaking capabilities. There is rarely anything better than a boutique pedal that works flawlessly. At least when it comes to guitar tone. 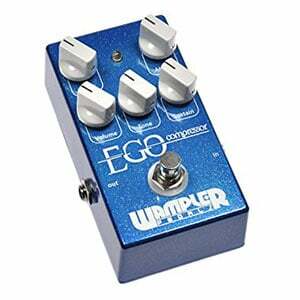 Wampler Pedals EGOCOMPRESSOR Essentials delivers that type of performance in a package that is every bit as refined as you might expect. The pedal itself doesn’t give away much purely based on its appearances. It looks average in many ways. However, once you plug this bad boy into your signal chain, the true size of the EGO comes out. Controls available are very versatile. We are talking four band compression with a few surprises here and there. Combined with the fact that it’s hand made using some very high end components, once can hardly make a case against this Wampler design. The price reflects everything we’ve talked about so far. This compressor is anything but affordable, however the price tag is completely justified considering the performance. If you need a quality piece of versatile compression in your arsenal, Wampler Pedals EGOCOMPRESSOR Essentials is a strong contender worthy of your attention. While we are on the topic of boutique wonders, let’s take a look at a really outlandish design by Empress. Their Effects Compressor might have a mundane name, but we can guarantee that there is nothing mundane or average about this bad boy. The pedal is a wide format design which comes with some standard, and a whole lot of not so standard features. Aside from your regular compressor controls, you can also adjust the input level as well as the output level separately. The top part of the control panel revels an LED graphic display which offers a great, tangible way of gauging what you’re doing on the pedal. You can select different compression and adjust pretty much every aspect of this pedal’s performance. This awesome beast comes with a chunky price tag, however those who need a reliable and extremely versatile compressor will find that Empress Effects Pedal is well worth the investment, and then some. With all these complex compressor designs, one can easily forget just how practical simplicity can be with this particular effect. Luckily for us, Electro-Harmonix is here to remind us with their Soul Preacher. Even though it really is simple, this pedal comes with two distinct functions. One is to provide you with a great compressor effect, and the other is to act as a sustain pedal. Some find this multi purpose role Soul Preacher is known for to be rather optimistic considering that you only have two control knobs and a switch to work with. However, in the end everything came together gracefully and we can now enjoy this little powerhouse of a stompbox. Using the Soul Preacher is easy. If you’re in compressor mode, the only thing you can impact is the attack value. The other knob is completely dedicated to sustain. While it might sound a bit underwhelming, this pedal can easily beat a number of its more expensive counterparts. This version of the Dyna Comp is based on the 1995 release, which still holds its ground to this day as one of the most well-recognized compression pedals on the market. A worthy addition to this pedal is the featured “in-line” compressor that evens out the signal to your amplifier perfectly, with naturally extensive sustain and sound dynamics. The featured control knobs on the pedal itself are intuitive and simple to use, coming in the form of Output – volume control and Sensitivity – amount of sound compression. This classic shuns any doubts and proves why it’s remained in production lines for so long, backing up your lead tones with remarkable sustain, playing around with the controls offering anything from smooth low-ends all the way up to outputting extreme metal-like sounds. This pedal’s effects will never overshadow your sound, instead they will naturally enhance it while keeping its intent intact. Truly a classic well worth its price in any guitarist’s book. EH’s Freeze Sound Retainer is undoubtedly the most unique addition to the list, as it actually works more as an advanced delay pedal while providing awesome sustain. The pedal offers a single large knob in the middle called Effect – controlling the overall volume of your sound effect. What make this pedal truly stand out is the three-way switch: Fast – presenting instantaneous sound capture and release via the footswitch, Slow – controls fade in/out times, and Latch – offering continuous sustain of your captured sound by pressing down the footswitch, which is disengaged by pressing down on it again. This unique masterpiece has a wide range of uses, it can enrich your sound in previously inconceivable ways, and you can get a feel out of it as if you brought an extra band member. It also blends in smoothly in a multiple pedals board setup. The wonderful pedal is the most recommended pick if you’re looking for something different and unique, it fits into a category of its own. Behringer is accurately portrayed as the patron saint of budget guitar players. Their pedals are some of the cheapest you’d dare to even look at, which still bring a great level of performance to the table. 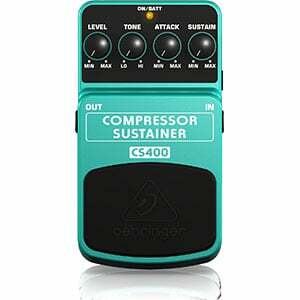 In terms of compression, one model which definitely sticks out is the CS400. This too is a compressor/sustainer combo, only this thing costs about as much as your average pizza. The real question is, just how practical and usable it actually is? Let’s start from the top. The pedal comes in the standard Behringer enclosure which isn’t the best, but serves its purpose. In terms of controls, you have your usual suspects – Level, Tone, Attack and Sustain. Performance you get from the CS400 is punching way above its price range. Sustain is abundant and feels natural enough, while the compressor part of the package has quite a bit of range. Combined together, these make for one very interesting budget design. If you’re looking to get a compressor on the cheap, look no further. In the world of effects pedals, Boss is a constant. No matter how much you burn yourself on other, less prolific brands, Boss will still deliver the usual performance. To some, this linear nature of their products is too boring. However, if you need reliability, that’s exactly the type of policy you want to be a part of. Boss CS-3 is a compressor/sustainer combo which comes with a great range and enough sustain to keep you going for a long time. On the outside, CS-3 looks exactly like any other Boss pedal, but it’s what goes on the inside that we are interested in. Compressor feels very responsive and fairly natural. You can cap off and boost a decent array of frequencies, and still retain your core tone configuration. When things start to drop off, the sustainer is there to keep on pushing. All in all, Boss CS-3 is one of the well rounded pedals you can get at the moment. Threshold & Ratio – determining the compression threshold (measured in dB) e.g. at which point volume-wise you want your sound to be narrowed down or up, and various tweaks to it. Attack & Release – controlling how fast you want the compression effect to engage and/or disengage. Gain – adding artificial gain e.g. boost to your signal, bypassing the compression threshold. Compressors are a very interesting type of effect. For starters, they aren’t as overt as some other pedals. When you plug in an overdrive stomp box into your signal chain, you will definitely know when it’s on. That isn’t necessarily the case with compressors. We say necessarily because there are several schools of thought when it comes to this and we are about to look into the most dominant ones. The most common way of using a compressor is to approach it as a tool that can iron out imperfections in your tone. When applied in this context, you won’t hear a compressor in the mix. However, you will definitely notice when said compressor is taken out of the signal chain. Ironing out various spikes and dips in your tone can be extremely beneficial. Right off the bat none of this sounds like something a beginner would even want to use. While that might be true, it is worth mentioning that learning how to use compressors from the start can only bring benefits down the road. Here are some concrete scenarios where a simple compressor can really change the game for you. If you are fingerpicking a clean guitar or an acoustic guitar, having some compression in there can even out your picks and make them sound more uniform.. Those who are into fast picking will benefit even more. On the other hand, alternate picking on an electric guitar with a heavy distortion applied can also benefit from a compressor. In some ways, a compressor can cover some technique issues such as the intensity of attack on the string and so forth. In summary, it’s not something that drastically alters the tone like a phaser pedal, but silent tool that irons out the quirks. Now that we covered the actual purpose of compressors, lets talk a little about what compressors can do in the overt sense. When you set compression parameters so that you eliminate peaks but also boost that lacking low end, one interesting thing happens. You get boosted sustain. Since the pedal is working hard to keep those notes going, you can use a compressor as a sustain pedal without adding any other changes to your tone. This makes it a great tool to use with clean guitars and acoustic guitars. Controls on an average compressor tend to be fairly simple. However, this also depends on the type of pedal you got. Compressors can be fairly complex, which has its benefits to say the least. Most basic compressors have two or three controls. First one is Level. This is the knob you use yo set the output of the pedal. Next comes the sustain knob which can be labeled differently depending on the pedal you own. Sustain allows you to set the amount of compression in the signal. These two represent the most basic control layout. In addition to Level and Sustain, you might run into Attack knobs. These are determining how quickly the compression is going to kick in. Again, there are more complex pedals on the market that allow for much more overall control. Placement of compressors is fairly important if you want to get the best performance out of them. Since compressors are used to unwanted spikes and dips in the signal, they are almost exclusively placed at the very beginning of the signal chain. 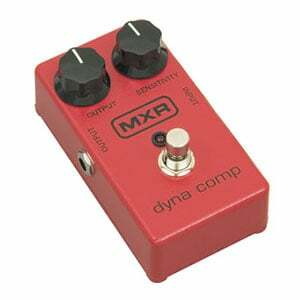 The only pedal you would want to put before a compressor is a tuner if you are using one in a pedal format. The reason for this is pretty simple. It is much easier to apply compression to a signal which is raw and pure of other effects. Once a guitar signal passes through five or six other effects, it would be much harder or even impossible for a compressor to sort it out. Even so, there are some applications which warrant that you put a compressor at the very end of the chain after a hot distortion and other pedals, but those are very rare. This is a question which many guitar players are asking lately. The answer is going to depend largely on how you treat your guitar tone. Those who aren’t that worried about imperfections in their tone may not find it useful to have a compressor as a part of their gear. On the other hand, those who are aiming for perfection will most definitely have a compressor pedal among other similar tools. When it comes to beginners who are just setting up their pedal boards, things are much simpler. Compressors are not something you need to think about in the beginning. Is it beneficial to knowhow to use one this early on in your journey? Sure, but it isn’t crucial. Truth be told, there are many other more important pedals that you should cover before reaching compressors. The thing to remember is to actually look into compressors at some point. Choosing between cheap and expensive compressors comes down to what you need. Most guitar players who aren’t familiar with this effect tend to start with something that is easy to work with and easy to understand. Such pedals are often fairly cheap. We can definitely recommend that you take this approach. It is much more beneficial to learn how to use a simple compressor. The last thing you want is to get one with all the bells and whistles, only to find yourself lost in all of the additional controls. Once you have figured things out and learned what kind of compression works best for your sound, then it might be a good time to consider some better and more expensive options. If you scratch the surface, you will find an abundance of awesome compressor pedals, many of which we have included on our top list. Just remember, once you start using a compressor, you won’t be able to play without it. That’s it for now as far as compression pedals are concerned. We featured some odd-balls and some staple classics, covering the needs of guitarists coming from various backgrounds. Don’t hesitate to check back here from time to time as we further enrich our list with worthy additions, our picks are carefully selected and offer the best balance in terms of price and quality. You should check out the Maxon. Best compressor I have ever used. One of the few that does not kill your attack or tone.